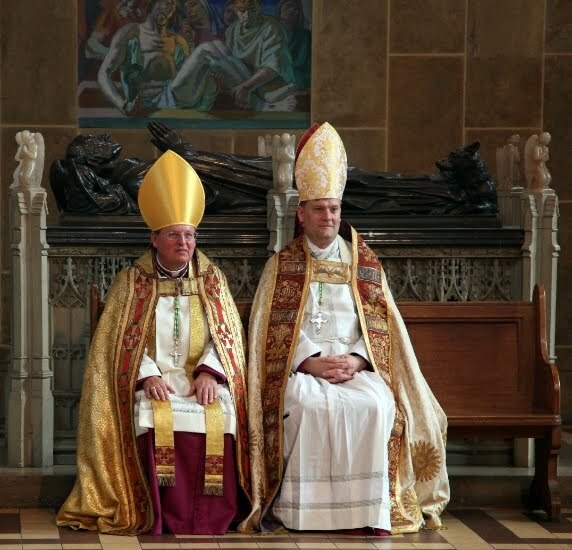 Streams of the River: Pray for our new bishops! and the rest of the day go HERE. This brief report of the consecration of of the new Bishops of Ebbsfleet and Richborough is taken, with thanks, from Fr Ross Northing's blog HERE. (Fr Northing's parish of St Mary & St Giles, Stony Stratford with All Saints, Calverton, is part of the Episcopal See of Ebbsfleet.) Also, to quote Fr Trevor Jones, "The Mass rite was Common Worship with a distinctly Catholic flavour, the preacher was Fr. Bill Scott, wisest of confessors and spiritual directors and domestic Chaplain to the Queen." (Go HERE for Fr Jones' post.) I will put the sermon on this blog when it becomes available. The Rev’d Dr Jonathan Baker is now the 4th Bishop of Ebbsfleet following a most memorable and inspiring Liturgy of Consecration at Southwark Cathedral when along with Fr Norman Banks he was consecrated Bishop in the Church of God. As the Liturgy started just after 11:00am the Cathedral was packed to standing room only and more continued to arrive. The turn out by the clergy was quite remarkable but the numbers of laity participating was truly humbling. Parry’s anthem “I was glad” lifted the roof somewhat as the Archbishop and co-consecrating Bishop’s entered the Cathedral; The Provincial Registrar read the Royal Mandate requesting the Archbishop to ordain these two men to the Sees of Ebbsfleet & Richborough; Fr Baker’s young daughter read the first Lection beautifully; you could have heard a pin drop as the two men were consecrated and the final hymn “Ladye of Walsingham” lifted the roof even more. A reception at Lambeth Palace followed and the Archbishop had been clearly moved by the numbers of people who had attended the Cathedral. Then back to Southwark to the Glazier’s Hall for another reception. The day was not over yet though for the two newly consecrated Bishops as we all journeyed to St Alban’s, Holborn where one of the largest London churches, with its most striking and moving mural on the east wall, was packed to see Bishop Jonathan celebrate Benediction of the Blessed Sacrament and Bishop Norman lead the meditation and prayers during it. At the start of this service the hymn “Come down, O love divine” almost exploded forth in what can only be described as a real outpouring of thanksgiving to God for the ‘gift and sign’ of two new Bishops to care for the Priests and People of the Sees of Ebbsfleet & Richborough. Pastoral Staffs were presented to the Bishops along with Pectoral Crosses and then another reception took place. A long, but glorious day.